Currently running a kickstarter to get The Link second run off the ground. If it’s not funded, the Link is a goner. If you like The Link or even like the idea of it, help get it back in action! Just click the image below! 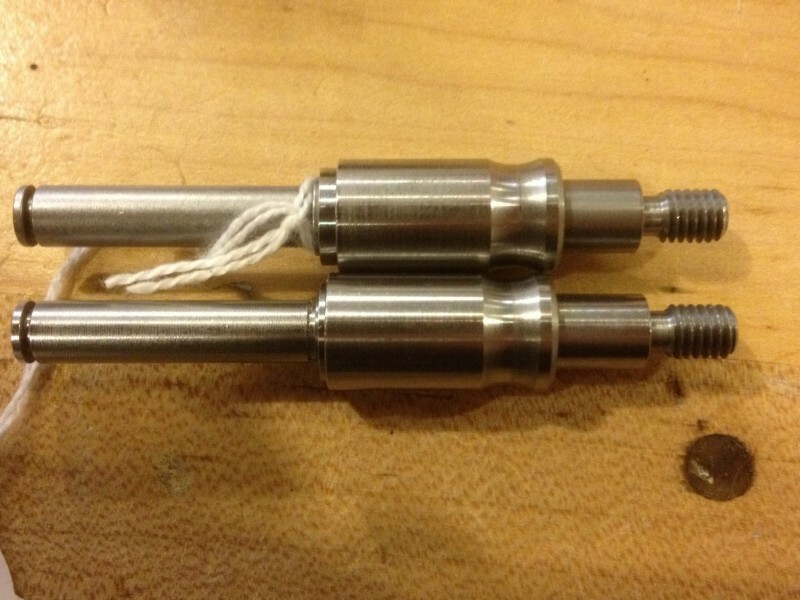 The Link is a new JLF shaft design that is purposed to allow easy storage for all kinds of players. The casual players looking to save a little space, and for traveling tournament players who need every inch when cramming into a full car. The new design is a two piece stainless steel construction. 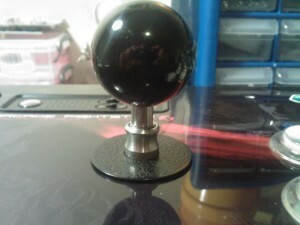 When in place, the Link is identical in height, allowing for you to drop it right into your current arcade stick that has a Sanwa JLF and feel no difference. The diameter of the center collar is perfect size so that you can keep your current dust washer, however the shaft cover will have to go! 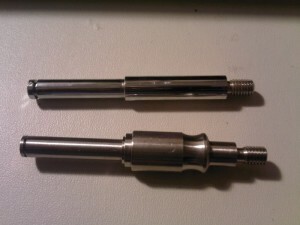 Compared to the original shaft, the Link is nearly identical. The few base changes are the collar locking/unlocking mechanic and the hollow construction to cut down on any added weight, as well as allow for future mods such as LEDs. Another key difference is in how the top is changed out. In the old design you had to utilize the flat head screwdriver slot to get ample torque to tighten the top enough not to loosen. 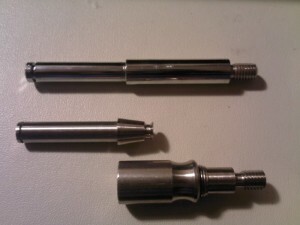 In the new design, the center of the top section has been keyed for a 3mm hex bit, allowing for a more streamlined approach. This is the same size required to take the top panel off of a TE, which makes install that much easier. Here’s a quick overview I’ve done, please excuse the horrible quality… video stuff isn’t my thing these days. If this takes off, and there’s enough interest, the “Link technology” so-to-speak, can be ported to any style shaft out there. Get interest in the current Link JLF and you can probably expect another type. How do I install a it? If you’re completely in unfamiliar territory, I suggest hitting up Youtube with just a “JLF Install” search string to cover your bases. It’s an extremely simple swap, with minor tools required, however Vicko has done a fantastic job overviewing how to install it into his HRAP. 1. 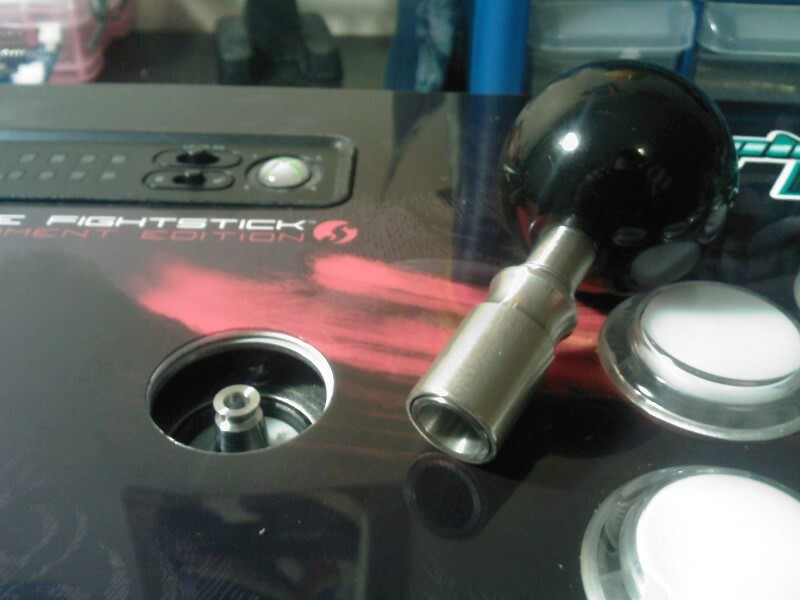 If you’re installing it into a Madcatz TE or one that has the second dust washer that lies on top of the pivot bushing, REMOVE THAT INNER DUST WASHER. They (and some others) have 2 in the stick, one on the control panel (which is fine) and an inner one that rests underneath the control panel, right over the pivot bushing. That inner one will cause problems, both in coupling the pieces together and connection, remove it and you’ll save yourself headache. 2. 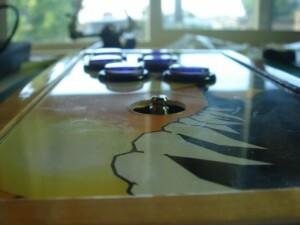 Custom plexi dustwashers may have an adverse affect. If you find it’s popping out during play and you have a custom dust washer. Remove said dustwasher and test the compared performance, you should see an improvement. A workaround to this is to put a counter-sink into the inner-diameter of that dustwasher, as it will alleviate problematic pressure on the collar of the Link from that hard angle. Will it come apart without engaging the collar ever? 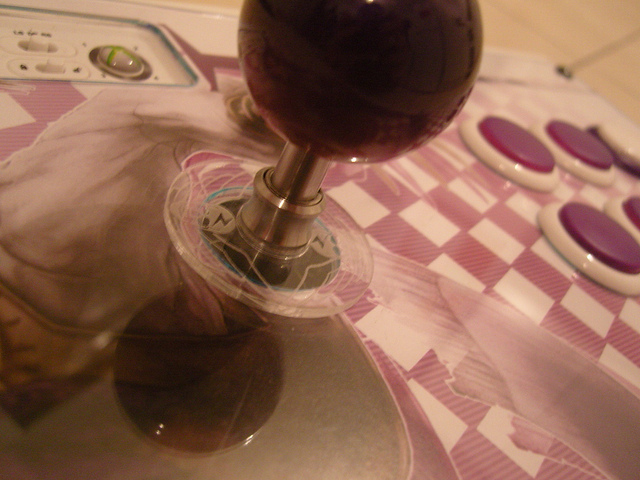 In short, yes it can, but only if you exert upward force that’s unnatural to standard play. There is a yield strength, it hasn’t been exact weight tested yet, but it won’t come apart unless you’re aiming to make it happen. It will not, and I repeat, NOT come apart during normal play if you do not touch the collar, that is a guarantee. This is something I’m looking into and perhaps in future runs this performance will improve, but for now I HIGHLY recommend against lifting up the stick by your ball/bat top. What do I do about the hole left after it’s been disconnected? 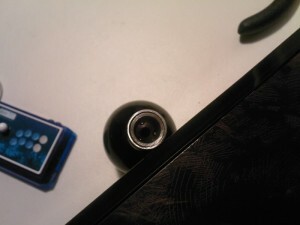 Working on that one, currently one of the best thoughts is to simply use a 24mm button plug with the tabs snapped off. The Link is made of 416 Stainless Steel, it is magnetic so you can get creative… or just cover it with painters tape during travel. 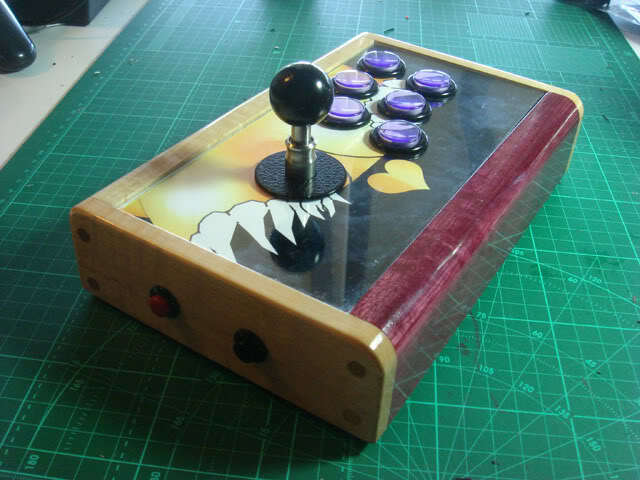 Below is a picture of someone not only showing off a hitbox/standard style hybrid stick, but also the use of a plug to cover the hole when it’s not required. I got it and put it together, but it looks like the collar piece doesn’t go all the way back down when locked together. This is normal behavior for now, future iterations may behave slightly different but for now this is OK.
New adjustments have removed much of the space shown above, and as such has also increased the linking strength, below is a comparison of the old vs. new, you will see a big difference in how far the collar goes down. Any questions you have not listed here? 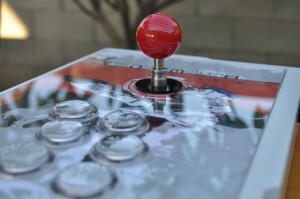 Follow the link below to the SRK thread and post up. I’ll try to answer as best I can in a timely manner. Currently they are ONLY available at Focus Attack. I won’t be selling directly for a little while, so if you want to grab one head over there and maybe pick up some other items you may need. getting a few these for sure, these is an awesome idea, pretty much what i have been looking for my traveling situation! 20-shipped and these would fly out the door. 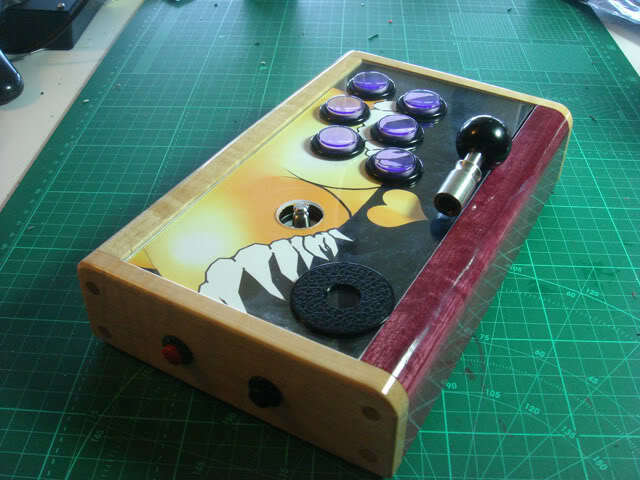 Or bundle it with a mod chip for EVO and people would eat this up! 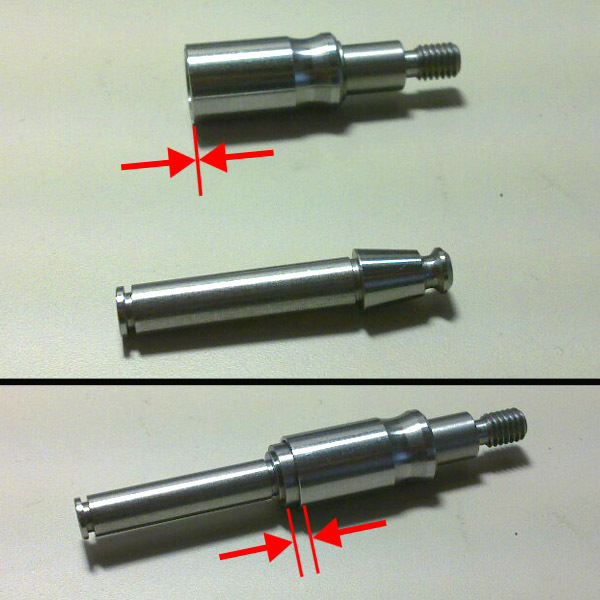 I think the fabrication cost would be reduced a lot by doing a simple slot at the bottom of the top shaft instead of machining a complex hex socket deep inside the shaft. A simple metal plate or ruler could then be used to screw/unscrew the ball/bat top. And since the bottom is inside the joystick when installed, you wouldn’t see those two cuts anyway. 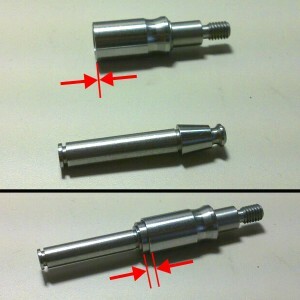 As for the lighting problem, you could try a white core light pipe (http://www.sparkfun.com/products/10693), you could have one part in the bottom and one part in the top. Only compatible with the slotted bottom idea, not the hex key idea. In any case, when can we buy these? Never mind my slotted bottom idea, the top part is made of two parts that can rotate, it won’t work! 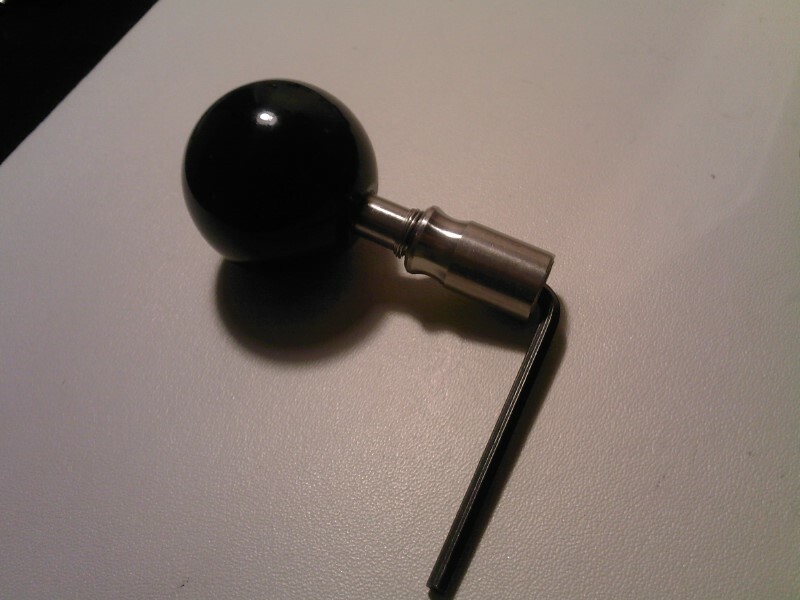 Then again, the slot could be in the top part of the top part… and a screwdriver could still be used to screw/unscrew the ball/bat top. Yeah the bottom slot is something that I’d prefer to stay away from. 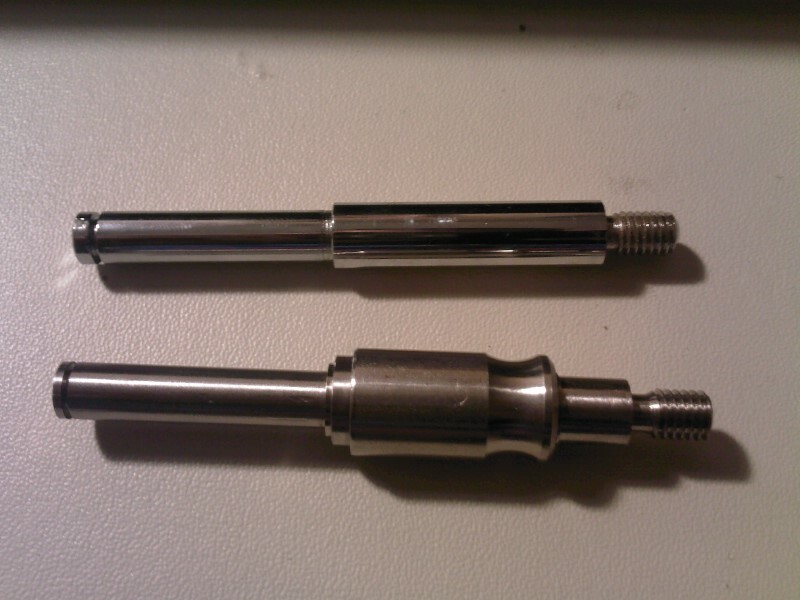 Believe it or not the inline hex keying of the top portion costs less than slotting out the bottom since it won’t have to rotate in the CNC, just change bits. A lightpipe was the first thing I tried out when I got the prototype, it doesn’t work as well as I’d hoped. I’ll get these out to the people, and if someone can come up with a slick way to do it then I’m all for it, but I haven’t got the time to develop that any further at the moment :(. 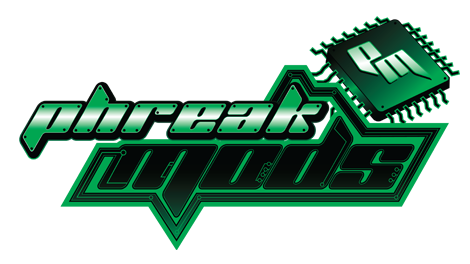 You’ll be able to purchase these from me (hopefully) at EVO this year, if you’re not going then see if someone you know is and can find me. I won’t be selling them prior though, there just isn’t enough time to make that happen. Could you set a poll or something to see how many top/bottom units people would want to buy? How small is the first production run going to be? Will it be stainless steel? will use this to switch from bat to ball !!! I preordered two just now. I’ve been really excited about this ever since it made the SRK frontpage however long ago. These are gonna be bigtime movers and shakers, I can just feel it! 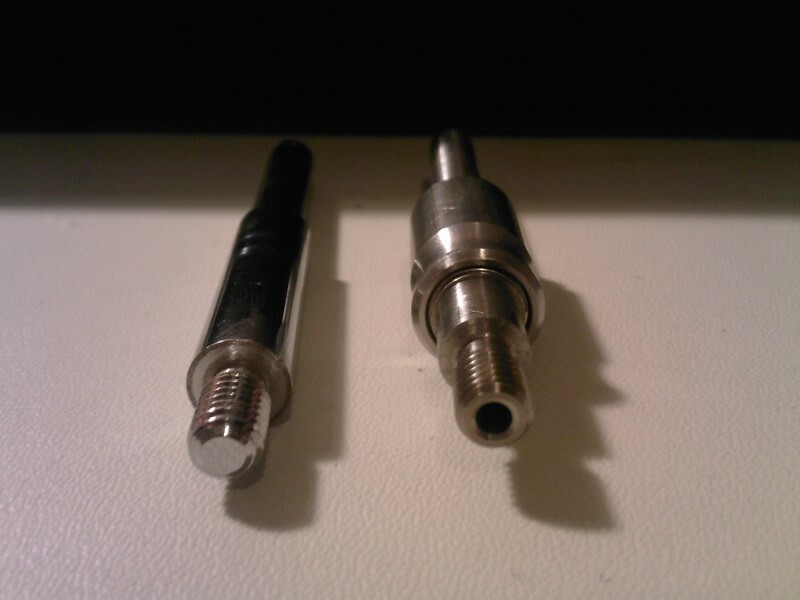 The new photos seem to show a non-drilled shaft? Not that it’s a deal-breaker, but I’d prefer a non-drilled shaft on the future production run too. 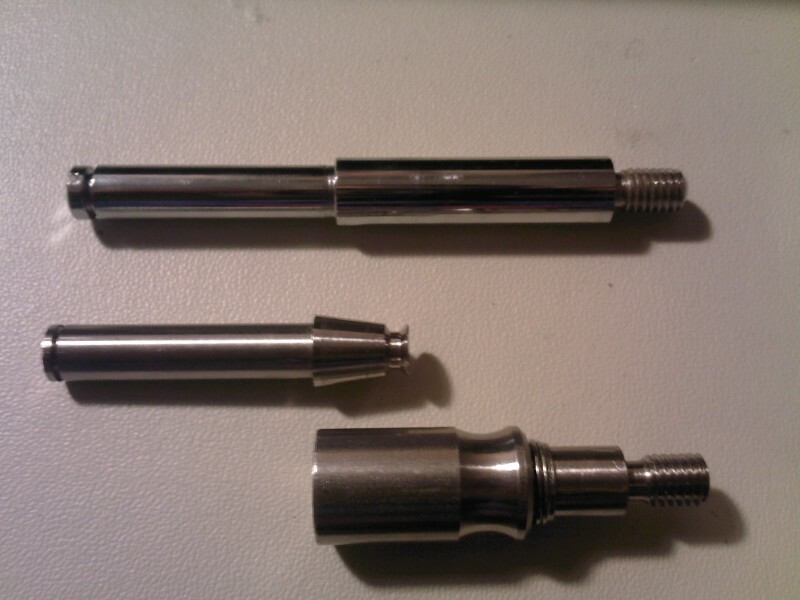 They will be drilled out, the non-drilled were like that for prototype reasons. Perhaps in the future if people really prefer them non-drilled I can switch over. Magus is right! Shipping to Brazil would be awesome, since I live there and am very interested in the Link! I just pre-ordered 2 to be shipped to the UK and I had no problem paying via paypal? I just selected the country from the drop down menu. I’ll be able to fit my stick in a messenger bag and have no ill effects to the mounting plate! Really happy! I’m sorry but this pre-order will exclude overseas shipping, US/Canada only. Due to limitations I can’t stop overseas customers from placing the order, but I will simply refund your money immediately if you fall under that category. I’m currently travelling and am planning on building some very light stick for…well, travel. This is just perfect, so I’ll get back at you in the future, hoping you’ll be okay to deliver oversees…but I’ll arrange with friends if not. Anyway, I wanted to ask if this device can adjust to a Seimitsu LS-32 as well ? I assume it doesn’t, and if so, are you planning to work on a comparable device for Seimitsu products ? Keep the good work, thanks for your input to fighter communities. I wish to pre-order a Link. Unfortunately for now it’s JLF only. perhaps in the future I can move it to the LS-32, but at the moment I simply can’t do that. I definitely want to, so it will eventually happen I believe, it’ll just take some time. Glad you guys like them. Currently I’m working some stuff out to get them to the general population, but for now only people who pre-ordered have them. That should change very soon here, I’m just getting some things in order before that happens. I like this shaft a lot, how do i go about to get myself on the pre-order list?